Paradise Island shopping is as laid back as the island itself - a far cry from the crowds and heat of Nassau. Of course, there isn't as much variety as there is downtown, but if you're looking for souvenirs, there's a lot to choose from. Some people have elevated shopping to an art form, but I'm not one of them! Still, it's fun to poke around in souvenir shops and or resort-wear boutiques. Or browse the luxurious, upscale Crystal Court Shops right outside the Atlantis Casino. 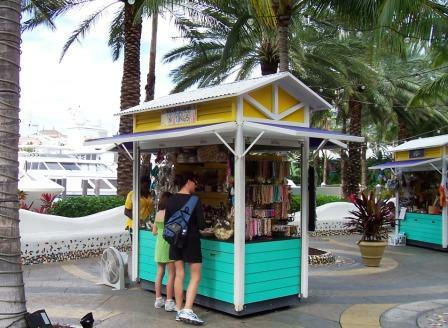 Directly across the street from the Marina Village at Atlantis, you’ll find the Paradise Shopping Village, a charming mall with a few places to get a decent meal and many little shops selling souvenirs and useful items for travelers. And don’t’ forget to check out the Bahamas Craft Center right behind the Shopping Village for all kinds of handmade items. Until very recently, a nearby shopping center called the Hurricane Hole Plaza (next to the Hurricane Hole Marina) featured a coffee shop, some boutiques, and a few reasonably-priced eateries. Unfortunately, the owners of the Atlantis complex bought the property and intend to develop it. All of the businesses have closed, and the buildings are being razed. It's a sad loss for budget travelers.